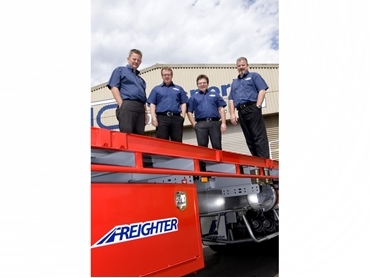 Leading Adelaide-based trailer dealership, Transport Connection has expanded its product range by adding prominent brands Freighter , Maxi-CUBE, Lusty EMS, Peki and AZMEB to its portfolio. Following the recent majority acquisition of the dealership by MaxiTRANS, Transport Connection now offers a significantly wider variety of products, making it a one-stop-shop for almost every type of transport equipment. David Rees, General Manager of Transport Connection explains that the new additions to their portfolio allow them to offer a complete range of trailer types from tautliners to skels, semis, refrigerated vans, tippers and side tippers. The expanded product range is backed by extended expertise within the sales team. A veteran of 34 years in the trailer industry, Mr Rees is proud of the team at his dealership comprising of product-specific experts from around the state. Gary Lines, for instance who joined the team recently has been the Freighter and Maxi-CUBE sales manager in Adelaide for the past 17 years. Kym Penhall was previously working as Spare Parts Manager at Transport Connection before moving on as the Lusty EMS sales manager in Adelaide. He re-joined Transport Connection when the dealership picked up the Adelaide distribution rights. Mr Penhall, who was earlier selling the Lusty EMS out of a small independent office, will now be doing so from a full-service dealership with parts and repair support on-site. Mike Bass rounds out the group, bringing a great deal of Hamelex White knowledge. He has worked with Transport Connection for 3 years, selling Hamelex White tippers throughout the period along with other trailers. Mr Rees concludes that all three men will use their shared knowledge of rigid bodies and tippers to work with the Peki and AZMEB range respectively. With B-Double access and coupled with its existing industry leading service and parts division, Mr Rees believes the dealership, situated in Adelaide’s transport hub of Wingfield can further build on its already strong reputation as a one-stop-shop for trailer enquiries.